Green Party presidential candidate Jill Stein has become the 33rd protester arrested at the Keystone blockade in Texas when she brought supplies to treesitters who have spent two months trying to block construction of the pipeline. 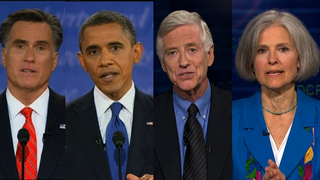 Stein connected Hurricane Sandy with climate change and criticized both Obama and Romney as "pipeline politicians." spread throughout November if Walmart doesn't listen to their demands. assistance to make ends meet. information and join to the cause. Fracking is headed to Maryland. The only way to stop it is to ban it. until it has a permanent ban on this toxic practice. below to view the petition. on the tips you voluntarily pay them at the end of your meal. to find out more and sign the petition. Micahel wants you to take action on "Support a Strong, Scientific Safeguard Against Soot"! Hi, I signed the petition "Support a Strong, Scientific Safeguard Against Soot". I'm asking you to sign this petition to help us reach our goal of 10,000 signatures. I care deeply about this cause, and I hope you will support our efforts. Governor Gary Herbert wants to turn some Utah's most spectacular wildlands into an Alberta-style tar-sands disaster, and we need your help to stop him. More than 140,000 acres in eastern Utah are already open to tar-sands strip mining, and regulators have permitted mining on nearly 6,000 acres; only an uphill court battle stands in the way of mining on the first of those lands. Tar-sands mining would decimate wildlands, destroy sage grouse habitat and deplete and pollute Colorado River water desperately needed by endangered fish and millions of people. Once mining begins, it could catalyze a wildly inefficient cycle of energy and water use -- igniting a carbon bomb that will further dry the Colorado River, melt the Arctic and acidify our oceans. Please take a moment to urge Gov. Herbert to abandon his disastrous tar-sands mining plans. Ruhestörung - so lautete der Vorwurf der US-Polizei, als sie am Dienstag die Präsidentschaftskandidatin der Grünen festnahm. Jill Stein hatte in Hempstead eine improvisierte Pressekonferenz abgehalten, um gegen das TV-Duell zwischen Barack Obama und Mitt Romney zu protestieren. Protect your water, stop pollution trading! I just took action and hope you can too. The EPA is considering rules that would legally allow polluters to "trade" pollution credits, allowing some people to pollute more, while outsourcing water pollution regulations to Wall Street. Please join me in taking action to make sure the EPA keeps the Clean Water Act strong, and doesn't allow pollution trading. http://act.foodandwaterwatch.org/site/Advocacy?s_oo=bPO7TaNibyf1MKIC7T7Czw&am... If the text above does not appear as a link or it wraps across multiple lines, then copy and paste it into the address area of your browser. We are at a critical point in our nation’s history. In the face of deep austerity measures, working and poor people are uniting. In the last few weeks alone, teachers in Chicago won a historic strike and Walmart workers walked out on the job for the first time. We must keep building the momentum. And that is why I believe that Green presidential candidate Jill Stein has the most thoughtful and thorough platforms for the American people. Can you pitch in $50 to Jill Stein’s campaign? If you’ve been waiting for the right moment to give, that time is now to show your support. A donation of $50 is critical in increasing our outreach to new voters seeking a change. Every dollar sends the message that status quo politics is not good enough. Together we will build the demand for Jill Stein’s Full Employment Program, breaking up the banks “too big to fail,” and a Green New Deal for all of us. We have so much at stake. By uniting our forces we can create and build our own alternatives to a system that is only helping a select few. Together we can rebuild a healthier democracy. This email was sent to proclus@gnu-darwin.org. To stop receiving emails, click here. You can also keep up with Jill Stein for President on Twitter or Facebook. Created with NationBuilder, the essential toolkit leaders. Michael wants you to take action on "Tell Banks to Stop Investing in Mountain-top Removal"! Hi, I signed the petition "Tell Banks to Stop Investing in Mountain-top Removal". I'm asking you to sign this petition to help us reach our goal of 5,000 signatures. I care deeply about this cause, and I hope you will support our efforts. It's time to pick the most outrageous eco-villain of 2012 -- use the Web address at the bottom of this email to cast your vote! The Center for Biological Diversity established the Rubber Dodo award in 2007 as a way to spotlight those who do their very best -- that is, their very worst -- to destroy wild places and drive species to extinction. The award, named after the most famous extinct species on Earth, is given out every year. I've had it with the media blackout! Stop sacrificing our climate on the election alter! Stop the pipeline! Here are more action items. Michael wants you to take action on "Don't Arrest Grandmas for Protesting Keystone on Their Own Land"! Hi, I signed the petition "Don't Arrest Grandmas for Protesting Keystone on Their Own Land". I'm asking you to sign this petition to help us reach our goal of 10,000 signatures. I care deeply about this cause, and I hope you will support our efforts. Until recently, U.S. officials have largely refused to engage, publicly and on the record, on specific criticisms of U.S. drone strike policy in Pakistan. But now, Acting U.S. Ambassador to Pakistan Richard Hoagland has gone on the record to defend the details of U.S. drone strike policy in a meeting with Just Foreign Policy and other U.S. peace delegates in Pakistan. Urge your representatives in Congress to follow up on what has been acknowledged, like the fact that the U.S. could compensate civilian drone strike victims and their families. just fell off a truck. That's right. Fell. Off. A. Truck. for its carelessness with radioactive material. We've been busy . . . Federal matching funds in the primary. Check! . . . Get on nearly 9 out of 10 ballots. Check! Our biggest task is still ahead: Get 5% of the vote and unleash $20,000,000 for the Green Party’s 2016 presidential campaign. 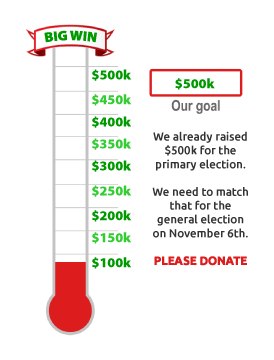 To stay on track for 5%, we must match our fundraising from the primary season by raising $500,000. Can you pitch in $5? Every dollar wins us more votes by increasing our media outreach and hiring more organizers to work on the ground in local communities. A win of 1% of the vote puts us firmly on the political map. A showing of 3% sends the message to any administration that serious momentum mounts for the Green New Deal. Winning 5% of the vote immediately translates to $20 million dollars in federal funding for our 2016 presidential bid. Can you help by contributing today? Hooray! I've been waiting for this moment for years! Good luck to the Walmart strikers! Walmart workers at various stores around the country are on strike today, protesting poor working conditions and alleged retaliation for their attempts to organize. The one-day strike was expected to culminate in a mass rally outside a store in Pico Rivera, Calif., this afternoon. OUR Walmart, a coalition of Walmart workers and other sympathizers, organized the protest. I'd just like to thank the Google bicycle mappers, who are contributing immensely to my health and sense of adventure. Former US ambassador and peace activist Ann Wright – who has arrived in Islamabad to participate in Pakistan Tehreek-e-Insaf (PTI)’s peace march to South Waziristan. Wright and Imran Khan spoke to the media in Islamabad on Sunday, September 30, 2012.